Mars is now a cold and dry place, but it wasn’t always like this – the Red Planet used to have a lot of water on its surface. Now, researchers have discovered one of the very last places where (potentially habitable) liquid water existed. This is a perspective rendering of the Martian chloride deposit. Water on Mars exists today almost exclusively as ice, with a small amount present in the atmosphere as vapor. The only place where water ice is visible at the surface is at the north polar ice cap. But even today, we still see clear evidence that the planet was once a wet place. Researchers from the University of Colorado Boulder have identified and analyzed such a place – a salt flat which was once a lake. Salt flats here on Earth are not especially uncommon. Natural salt pans or salt flats are flat expanses of ground covered with salt and other minerals which usually form when salty water pools evaporate. Based on the surface and apparent thickness of the salt, researchers estimate that the lake was about 8% as salty as Earth’s oceans – which means it was quite hospitable for microbial life. “By salinity alone, it certainly seems as though this lake would have been habitable throughout much of its existence,” Brian Hynek, a research associate at the Laboratory for Atmospheric and Space Physics (LASP) at CU-Boulder and lead author of the study. However, other relevant factors for habitability such as acidity were not the scope of the study and were not considered here – in fact, the potential habitability of the lake was not explored at all. 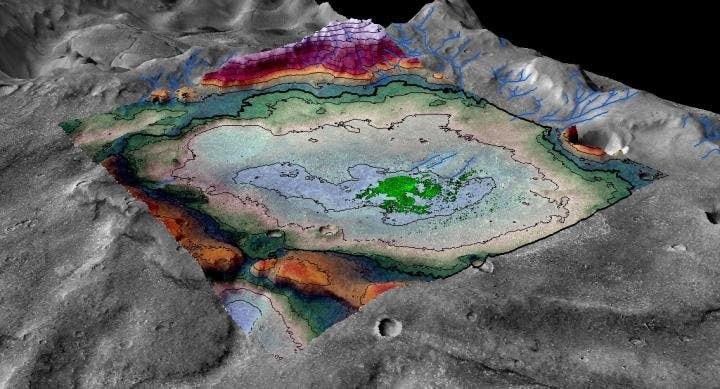 But what’s interesting about this formation is its age: digital terrain mapping and mineralogical analysis of the features surrounding the deposit indicate that the former lake bed is no older than 3.6 billion years ago – which means that it hosted water for a very long time, and was one of the last watery places on Mars.